The vice president counted Trump’s actions in favor of “religious freedom” as reasons why voters should support Republicans in the mid-terms as well as with other factors, including a booming economy, lower taxes, support for immigration enforcement and a tougher stance on America’s adversaries across the globe. Although the Trump policies Pence referenced on the National Day of Prayer didn’t explicitly contain any language seen to hamper LGBT rights, it directed U.S. Attorney General Jeff Sessions to draft further to ensure “religious freedom” is protected. Sessions ended up issuing guidance that allows individuals and businesses to act in the name of religious freedom — often used as an exercise for anti-LGBT discrimination — without fear of government reprisal. Nowhere in the guidance is there a limiting principle assuring the right to free exercise of religion should be an excuse to engage in anti-LGBT discrimination. The second policy Pence referenced is the establishment of the Conscience & Religious Freedom Division at the Department of Health & Human Services, which critics say allows medical practitioners to deny abortion-related services and treatment to LGBT people on religious grounds. HHS followed up with a proposed rule change that allow medical practitioners to invoke a religious exemption to get out of offering abortion-related services and transition-related care for transgender people, including gender reassignment surgery. Other provisions condoning religious counseling were construed as allowing federal payments for widely discredited “ex-gay” conversion therapy. Pence himself is known for taking action in the name of “religious freedom” to enable anti-LGBT discrimination. As Indiana governor, Pence signed into law a “religious freedom” measure widely criticized for allowing individuals and businesses to refuse service to LGBT people. After an outcry from LGBT rights supporters and the business community, Pence was forced to sign a “fix” limiting the ability to discriminate under the law. The vice president alluded to further actions in favor of “religious freedom,” predicting Brett Kavanaugh will soon “will soon be Justice Brett Kavanaugh” upon confirmation by the U.S. Senate and issue rulings in line with social conservative thought. The confirmation of Kavanaugh, which is opposed by progressive and LGBT rights groups, is being held up in the U.S. Senate after the emergence of allegations from Christine Blasey Ford he attempted to sexually assault her in 1982. 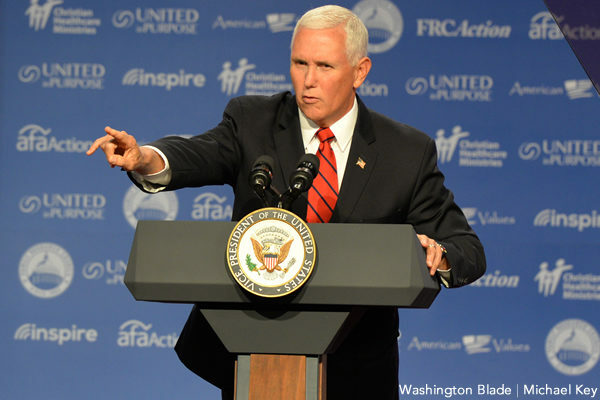 Pence faced criticism from LGBT rights supporters by agreeing to attend the Values Voter Summit based on the anti-LGBT policy objectives the Family Research Council and the speakers that appeared on stage before and after him. David Stacy, government affairs director of the Human Rights Campaign, said speakers at the Values Voter Summit are known for expressing support for conversion therapy and condemned Pence for appearing with them.